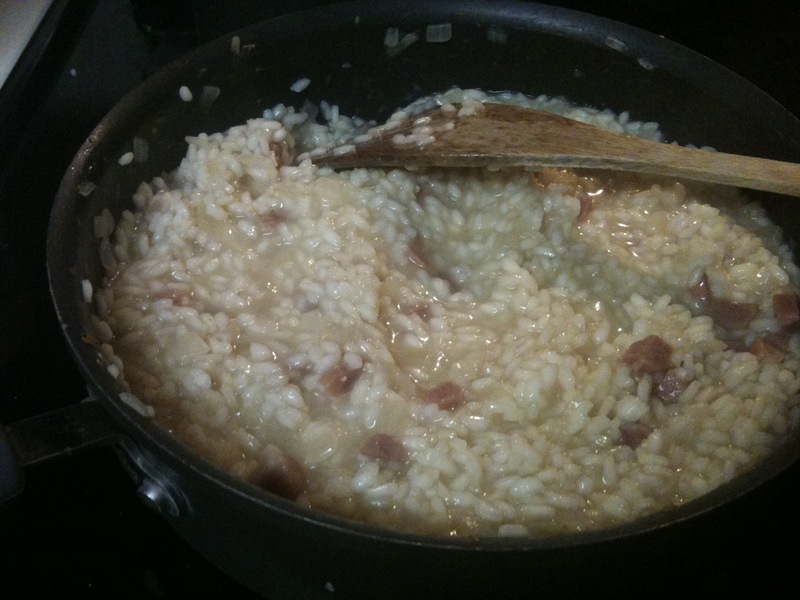 On New Year’s Day, I made risotto for my adopted family–several of whom had never had risotto–and I’m proud to say that this is the best I’ve ever done with the dish. (The stakes were high. I had steely-eyed focus.) Normally, I over-stir, or under-water, or both, and the result is a tasty sludge. And I’m okay with that, until the once or twice a year I have risotto milanese made by my stepfather, the North Italian chef. He ladles it onto the plates with the ease of instinct and of many years of practice, golden with saffron and perfectly all’onda. With that memory firmly fixed in my mind’s eye, I stirred less than I normally do, and added one more ladle of liquid than I normally would. The result was not, I admit, that legendary “ripple;” but it was the closest I’ve gotten yet. And now onto today’s Self-Indulgent Digression (SID? ): those pink chunks? Country ham. The Cook’s Illustrated recipe I opened for reference called for “pancetta, proscuitto, or country ham.” The first two were out of the question in a small southern town. However, being in a small southern town after the holidays, there were literally pounds of country ham in the fridge. It tickles me pink when the gourmet and the backwoods cross paths. Like how Paul Bocuse and the bayou-dwelling Cajuns can agree on boudin.